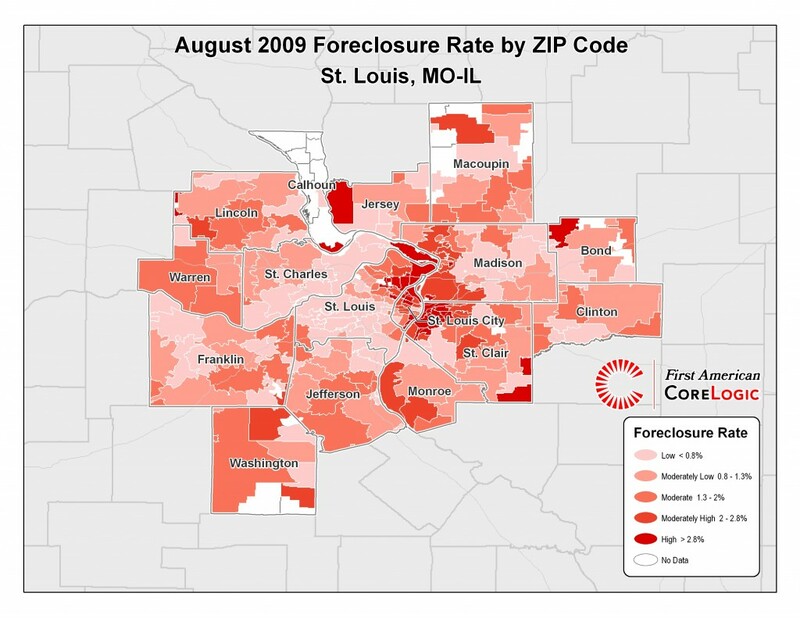 Foreclosure rates in St. Louis increased for the month of August over the same period last year according to a report released today by First American CoreLogic. The report showed the St. Louis metro area to have a foreclosure rate of 1.24 percent in August, up just slightly from July’s rate of 1.20 percent, but up over 63 percent from a year ago when the rate was 0.76 percent. As bad as the foreclosure rate for St. Louis sounds we are still doing better than the national rate of 2.86 percent for August. The state of Missouri had a foreclosure rate of 1.16 percent for August, up a whopping 84 percent from a year ago. It doesn’t appear the rate of foreclosures is going to slow down anytime soon as mortgage delinquency rates rose again in August. In St. Louis 4.64 percent of borrowers were 90 days or more delinquent on their mortgage in August, up 47.6 percent from a year ago. The 90 day mortgage delinquency rate for the state of Missouri in August was 4.44 percent, up almost 50 percent from a year ago, and for the US the rate was 7.10 percent, up 70 percent from a year ago. Where are the City and County officials? In Ballwin our subdivision alone has 17 forclosures. The subdivision behind us one whole street or 7 out of 9 houses have been forclosed on. No home preservation programs. No moratorium. Our house value has dropped over 30% since a year ago. The eeary silence is deafening. Get off your azz Mayor and others and do something. Ballwin is way to worried about an artist and his art to handle the forclosure crisis.